Perhaps you’ve been told to count your baby’s diapers to make certain he is getting enough milk. The general rule in the first week is 1 diaper per day of life. How is a new mom supposed to remember that? Here is a way to label your diapers for the first week to help you keep track. As you go through your stack, the number and letter combo will let you know if your baby is on target or ahead on soiling. 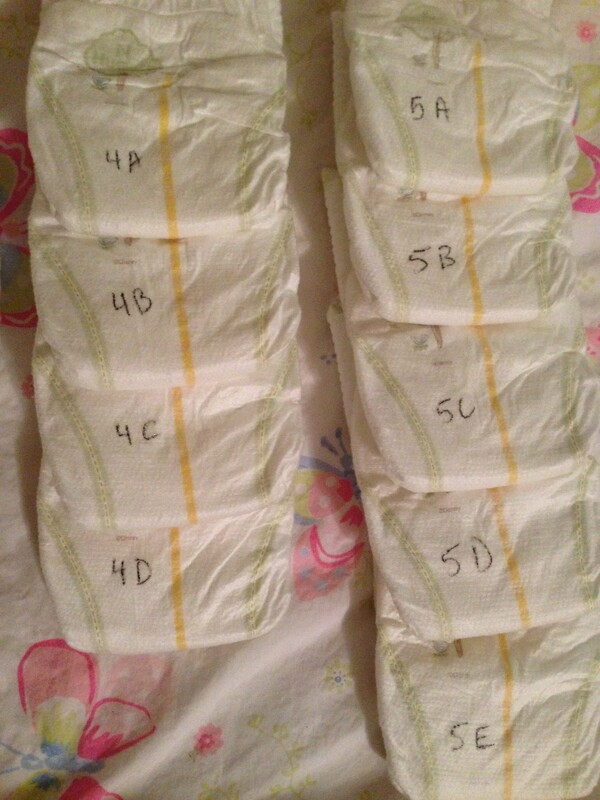 Here are diapers labeled for the first 5 days. If you are on day 3 and diaper 3A or further in the stack, your baby is taking in adequate milk. If your baby is not on target, call your LC for help. Diapers 1A-3C should accompany you to the hospital or birth center to help you keep track. Diapers 4A-5E are the hardest to remember because mom and baby are so busy feeding and changing frequently.